Discover the best drawing pens for artists! Before you even start making pen and ink artwork, you will need to make two important choices: what kind of pen(s) and paper will you use? On another page we discuss the best types of paper to use if you are making pen and ink artwork that you plan to sell. On this page, we'll talk about the best brands of artist pens to use if you want to create pen and ink drawings that will stand the test of time. 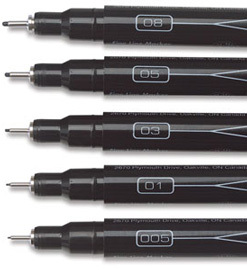 When choosing a drawing pen, it's best to look for one that is labeled "archival". Archival pens contain inks that won't fade or lighten over time (as long as the artwork is properly handled, stored and displayed). Archival pens are the best choice for fine artists because you want your drawings to last as long as possible, especially if your artworks will be sold. At the very least you definitely want your art to last a lifetime, preferably for centuries or even millennia! Your art stands a greater chance of long-term survival if the materials you use are archival. * Drawing pens are filled with either pigment ink or dye ink. Artwork created with pigment ink will last longer and retain color better than artwork created with dye ink. Based on the above criteria, here are 3 of the best drawing pens for artists. I have used each of these brands so I can vouch for their quality! Prismacolor Premier Illustration Markers are my current favorite when it comes to artist pens. Although they are labeled as "fine line markers", these Prismacolor markers are actually more like pens than markers. They come in a range of nib sizes, from 005 (the smallest) to 08 (the largest). In addition to black, they are also available in blue, brown, green, orange, purple, red and sepia. The tips of these artist pens are very durable. In the past I've used other art pens that had nibs that became easily bent if too much pressure was accidentally applied, but I've never had that problem with these Prismacolor artist pens. Sakura Pigma Micron Pens are another excellent choice for pen and ink artists. These pigmented ink artist pens can produce nice smooth lines that dry quickly and won't smudge once dried. 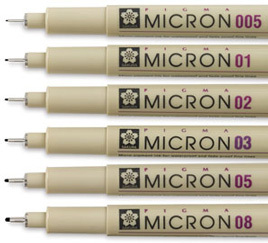 Sakura Pigma Micron Pens are available in 6 sizes, from 005 (the smallest) to 08 (the biggest). They are sold singly and in sets. They come in a variety of colors in addition to black, such as sepia, blue, blue/black, brown, burgundy, fresh green, green, hunter green, orange, purple, red, rose, royal blue, and yellow. Staedtler Pigment Liner Sketch Pens are another fine choice when it comes to archival artist pens. They are only available in black and come in 4 sizes, from 01 (the smallest) to 07 (the biggest). The 3 brands of drawing pens mentioned here are amongst the best pre-filled ink pens that artists can buy, and they are relatively inexpensive as well, with each pen usually costing under $2. If you're not sure about which archival pen to buy, visit your local art supply store where they usually have a pad of test paper next to the pens so you can try them out before you buy. Return to the Pen and Ink Table of Contents, where you can find info about creating your own pen and ink drawings, as well as links to pen and ink artists!